While readers of this site have known for months that a broad sell-off in all assets was more than overdue (which we are witnessing today as investors around the world dump everything and rush to cash), it is important to put a bigger picture perspective on what is occurring. The world is selling off based on the utterance of the word "taper" by Bernanke a few weeks ago which he acknowledged again in his testimony yesterday. 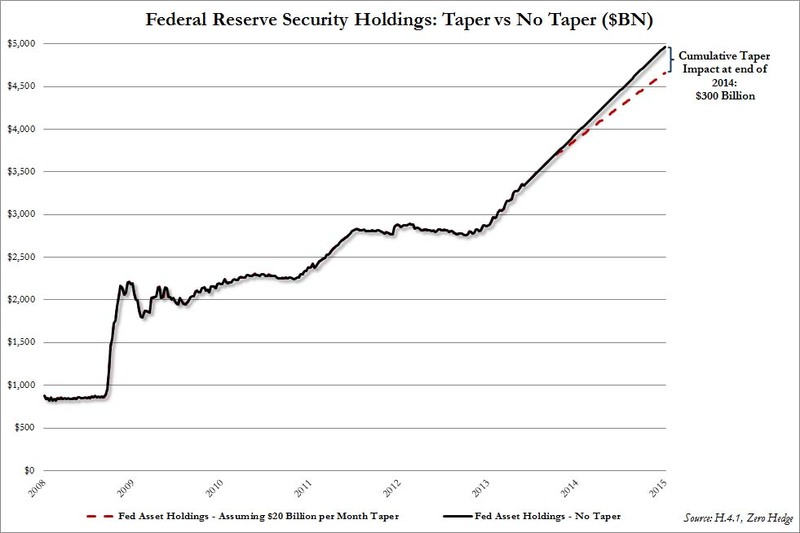 Tapering means that the Fed will purchase less than the current $85 billion of bonds it is currently purchasing every month. As a reminder, the Fed prints money out of thin air to purchase these bonds; a process known as Quantitative Easing (QE). Before we discuss what will actually happen, it is staggering to think about what the markets would do if the Fed were to actually begin the process of "normalizing" rates. Remember that during this now 5 year running artificial expansion the Fed has been buying assets (bonds) and flooding the market with cash. During an exit strategy, which the Fed tells us is entirely possible, it would have to stop buying bonds completely and then sell bonds into the market to reduce the size of its balance sheet. Can you imagine what would happen should that occur? Today we are talking about just a minor little reduction in what they are buying and there is a global earthquake in the financial markets. Imagine if they were forced to sell! The truth is, something we have long discussed here, the Fed can never sell. They have painted themselves into a corner and their only solution from here is to talk the markets into believing that there is a possible exit strategy that would not destroy the financial system overnight. Hint: There is not. But back to where we are today. The Fed is trying to set up a scenario where they can announce the reduction of what they are purchasing sometime around their September 2013 meeting. They are trying to prepare the markets for this coming announcement as delicately as possible. 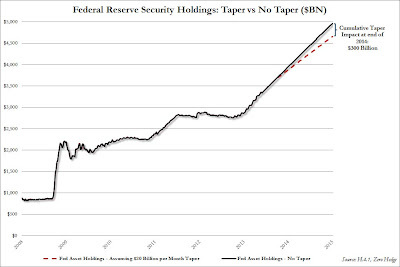 Zero Hedge put together the following graph, which sums up what a "tapering" would look like beautifully. If the Fed were to reduce their bond buying by $20 billion per month (taper), down to just $65 billion, their balance sheet would still be growing exponentially, just at a slightly slower pace. We have discussed for months now the importance of ignoring the artificial "recovery" in the financial markets and the focus toward raising cash to prepare for the coming sale on high quality assets. Some of my favorite long term assets have now begun to decline significantly and they are closing in on the first taste of a buying range. Now that everyone is beginning to panic, if the long overdue sell-off is finally here, then you can begin to exchange your cash for top quality assets as they are thrown out with both the baby and the bathwater. The chart above should help keep the big picture in perspective on how this story will ultimately end. Was wondering if you would give a few high quality asset pics you are thinking about adding.